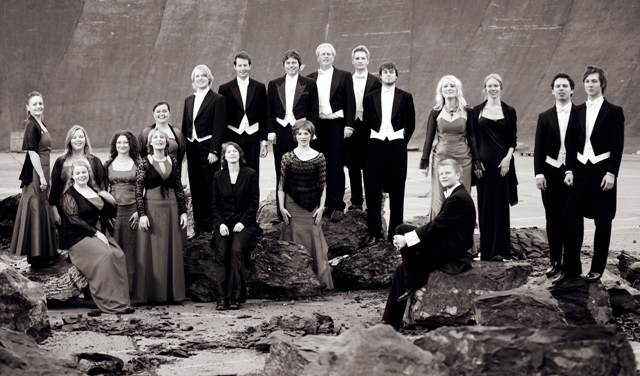 Det Norske Solistkor (The Norwegian Soloist's Choir)was established in 1950 by the Norwegian Soloists’ Association to be an elite ensemble with top artistic goals for the performance of choir music. Their first conductor was Knut Nystedt who led the choir for 40 years. He was succeeded by Grete Pedersen in 1990, and she is still the choir’s artistic director. The choir cooperates on a regular basis with different orchestras such as The Norwegian Radio Orchestra, The Norwegian Chamber Orchestra and the Italian baroque orchestra Europa Galante. The choir continues to world premiere works by Norwegian and international composers. At the same time, the choir’s base is classics in the Nordic and international choir literature. The individual singers are highly trained, hand-picked performers, all of whom are soloists in different genres. The number of singers in the choir varies according to the type of music being performed. The Norwegian Soloists’ Choir performs nationally and internationally, in concert halls and churches, ballrooms and bus garages. The choir often use guest conductors such as Tonu Kaljuste, Fabio Biondi and young Norwegian conductors. Their recording of Edvard Grieg’s Choral Music (2007) received international critical acclaim. In recent years issued CDs (all on BIS records) are: ’White Night – impressions of Norwegian folk music’ (2010) and 'Im Herbst', a very succesful CD with romantic choral music of Schubert and Brahms (2011). The latest recording is 'Refractions' (2013) with choir music of Valen, Berg, Messiaen and Webern.